Who can take the title of best dressed? Zhou Dong Yu arriving with her castmates from the movie Lost in White. There are Tong Da Wei and Vision Wei. She looks a tiny bit grown up with the side-swept bangs. Sparkly purple heels. How cute! Chen Qiao En and Zhang Han for I’ll Never Lose You. Both are very sparkly but they didn’t look tacky. No socks? 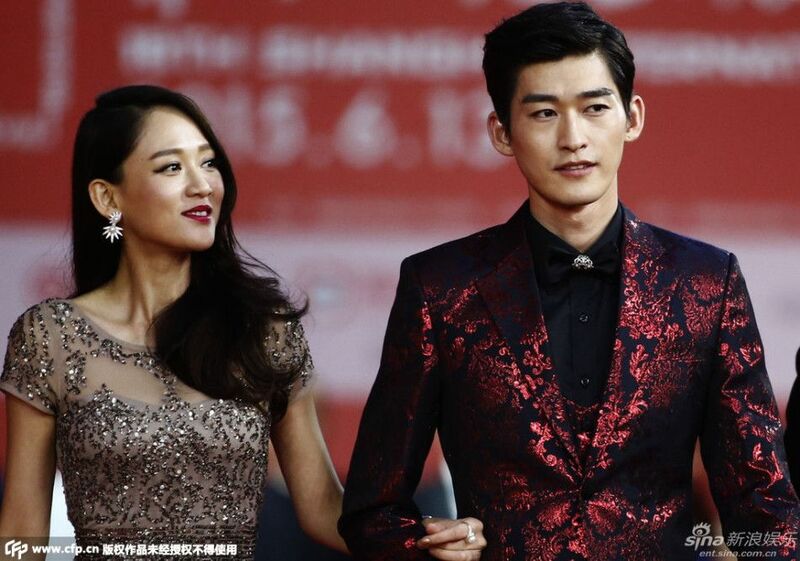 I rarely say this but Zhang Han looks handsome with that smirk below. Tang Yan in a lovely blue dress representing the movie she’s doing with Aaron Kwok and Yao Chen tentatively called People in Business. How come she never looks tired even though she’s working non-stop? Kimi Qiao and Viann Zhang arriving together because they’re shooting a new film, Magic Card, together. Her make-up is always very intense. The dress is a step up from her peacock dress last time. I thought Kimi would show up PINK. Lol. Tony Yang, George Hu, and Haden Kuo from Where the Wind Settles. Wang Luo Dang and Tian Xin from Detective Gui. Awww Zai Zai wasn’t there! 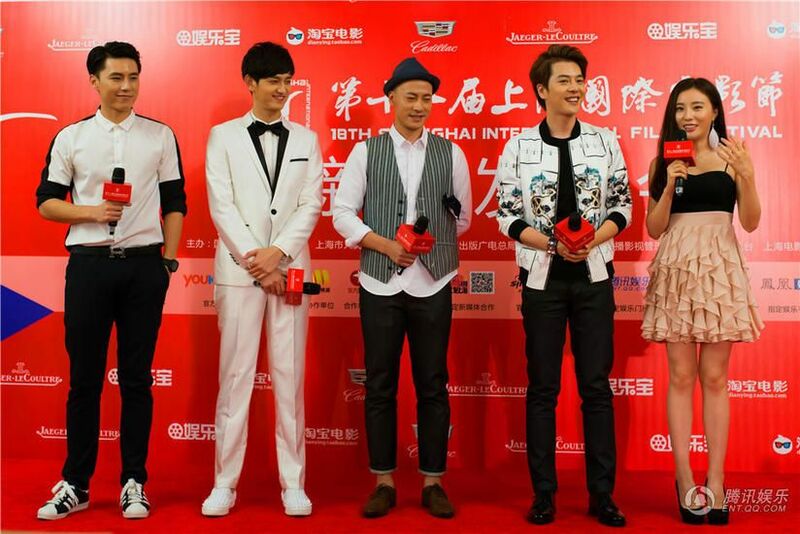 Eddie Peng, Shawn Wei, Wang Luo Dang and the cast from To The Fore. 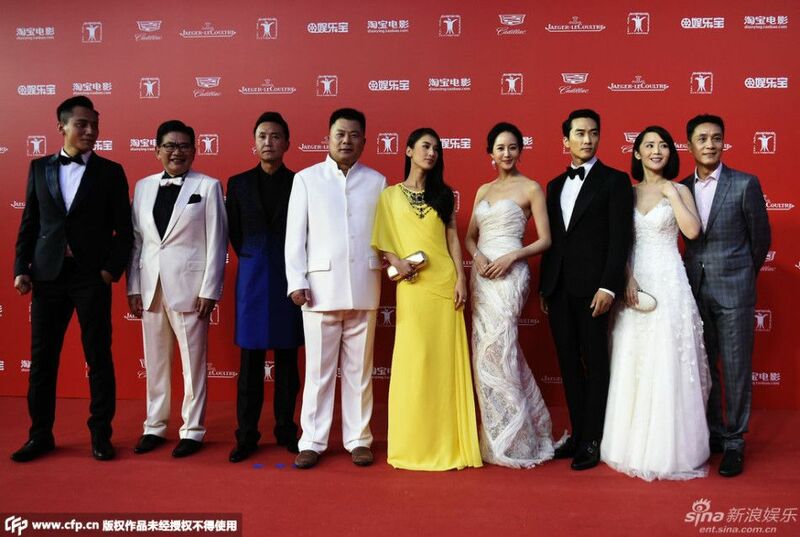 The big group from the upcoming war film, Bombing of Chongqing. 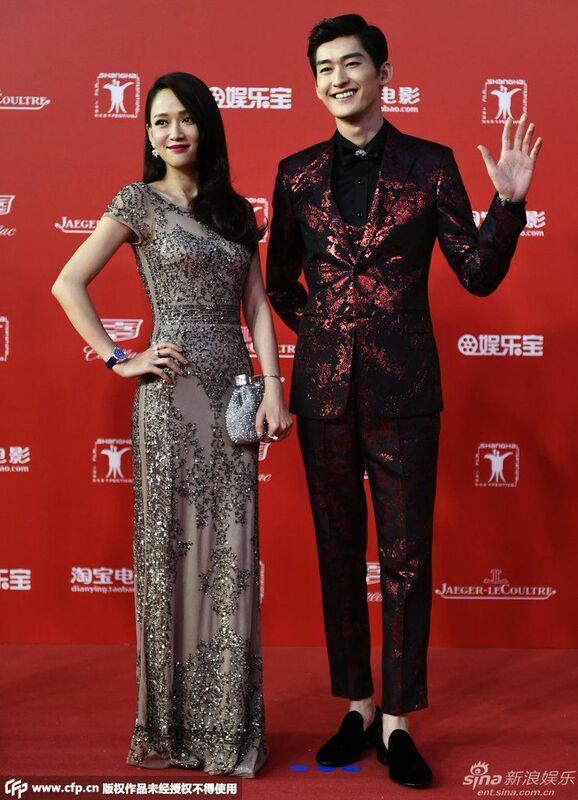 There are Janine Chang and Song Seung Hun. Ruby Lin in the arms of Tony Yang for The House That Never Dies 2. She’s glowing in that dress and flawless hair! She also has a fluttery tail. Lilian Wang is one lucky sister! She has both young boys – Aarif Rahman and Ma Tian Yu – guarding her! They were in the Chinese Edition of Sisters Over Flowers. 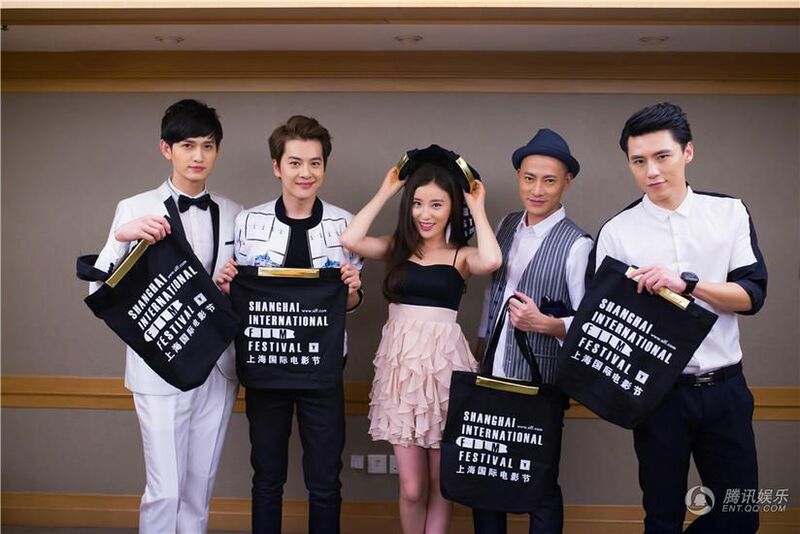 And look what we have here: Fan Bing Bing in the protection of Wu Chun and Leon Lai for Lady of the Dynasty. 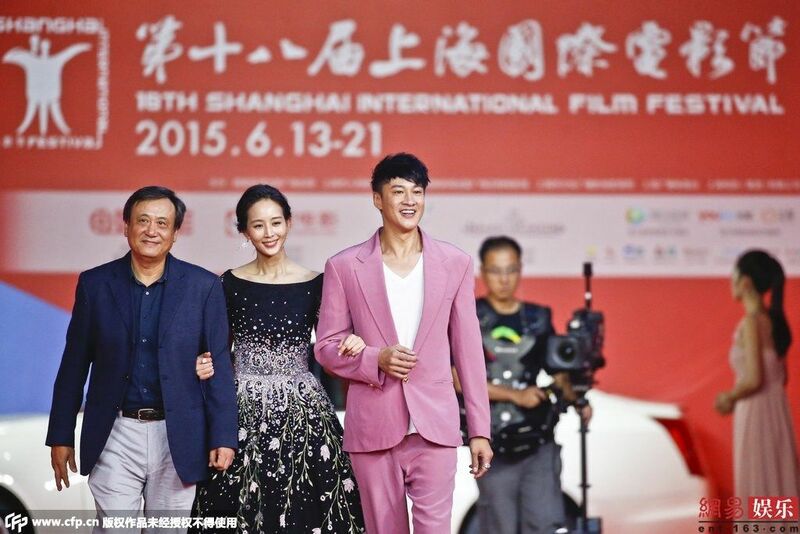 Peter Ho shining with Janine Chang right by his side. They’re here for One Minute More. The young and rather unknown cast of The Legend of Flower. No Wallace or Zhao Li Ying. I recognize Ma Ke and Joe Xu Hai Qiao. 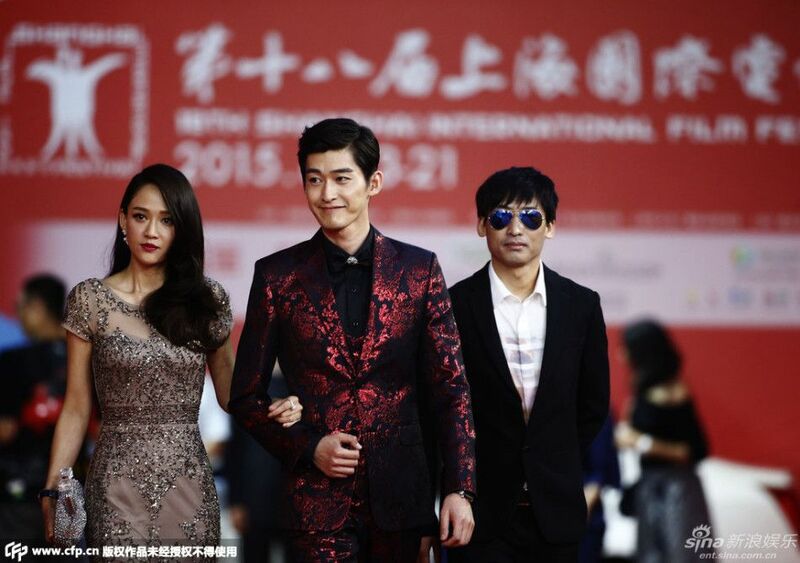 This entry was posted in Entertainment News and tagged Red Carpet, Shanghai International Film Festival by Kappy. Bookmark the permalink. Love all the men in navy! Oh Peter, why, why, oh why pink!?! I nearly swallowed my pink strawberry tic tac whole ’cause of you. Still love you… *grumbling for words* till the day I die. Shoulda been a reverse color swap – white suit, pink tee. Seen him in that ensemble before – hotness goes well with his healthy tan. I don’t have the energy to critique on other evening dresses. Let me just say: WT…. Oh? Did Janine have an outfit change? And Wu Chun! Haven’t seen him acting since foreverr! And I must say Ruby continues to impress despite her age! She is truly one beautiful woman! &&, is that Tian Xin I see? My favourite would also be Chen Qiao En. She is pulling off that dress really well! and For ladies, Chen Qian En.. she pulled it well.. just amazingly beautiful on her. But for best makeup, i should say Fan Bing Bing, her makeup artist is good. What happened to your Eddie avatar, Yui! I like Aarif too. He’s so handsome! Aarif was pretty cool when he played his role as Bruce Lee. I haven’t had the chance to finish watching him in Noonas Over Flowers (Chinese Version) variety show. Hola, thank you so much for this . .
My friends and I still go to Ruby Lin as our favourite. Inspite of her age, Ruby never stopped to amaze us of her youthfulness and zest for life. Her be-dimpled and gentle, classic face always charmed us . . Her choice of clothing apparel is wise and with style. And we noted also that she is still sought to be a commercial model of skin care products and other items . . For us, Ruby Lin is an epitome of women who grew on their age – very gracefully and with wisdom . . .
Peter Ho still looks good with that pink-colored suit, defying the traditional dark-colored suit. Muchas gracias. Todo lo mejor. Totally agree with you about Ruby Lin! 😀 I think she looks the best out of all the beautiful ladies here. Gracias Shimokuren. Thank you so much. Indeed, Ruby Lin is one elegant woman here, who is pleasingly graceful and stylish in appearance. Ruby is stunning that night. Love her whole ensemble. I can’t pick between hers and Chen Qiao En. Hola Kaptain A, we owe you so much of gratitude for all these beautiful pictures and posting. All of us at work are huddled again in our lunch time to see the lovely ladies and good looking guys here . . Thank you very much. Eres tan ingeniosos. You’re so resourceful and diligent. . .